!! !Last day school sign links and instructions at bottom!!! I’m not sure who was more nervous on Maxwell’s first day of school, him or me. I remember driving down the winding country roads that chilly August morning like it was just yesterday. I wanted to be hopeful that school would some how all work out, but with all the obstacles ahead I just wasn’t sure how this new journey would turn out. Shockingly, this entire school year has been only about progress and I’m happily writing this post to shout to the world how amazing Maxwell is doing. I don’t know how to express how truly proud I am of Maxwell for everything he has overcome. We started that first day of school with Maxwell quivering and screaming while being pulled from the car, it left me shooken up; anxious and wondering if the stress would trigger Maxwell to have a seizure. I was horrified that I wouldn’t be there to catch him if he fell. Fortunately the teachers were able to calm him, he stayed at school for the entire day. The days to come didn’t get any easier, then magically a few weeks in he was wanting to go to school, even sad on the days there was no school. Ironically just before spring break he looked incredibly and dramatically disappointed when I told him that over spring break he would spend the entire week with me. Ya, way to make me feel like an awesome Mom, but actually in our own situation it does. Maxwell has trouble (since birth) separating from me, to see him so over joyed and spreading his wings on his own lets me know I’m doing something right. I guess I’m just not as fun as all his school friends he’s made. Even taking pictures was a entirely different ball park, Maxwell was relaxed, excited and happy to be in front of the camera. Typically taking pictures was a task that came with much anxiety for Maxwell. 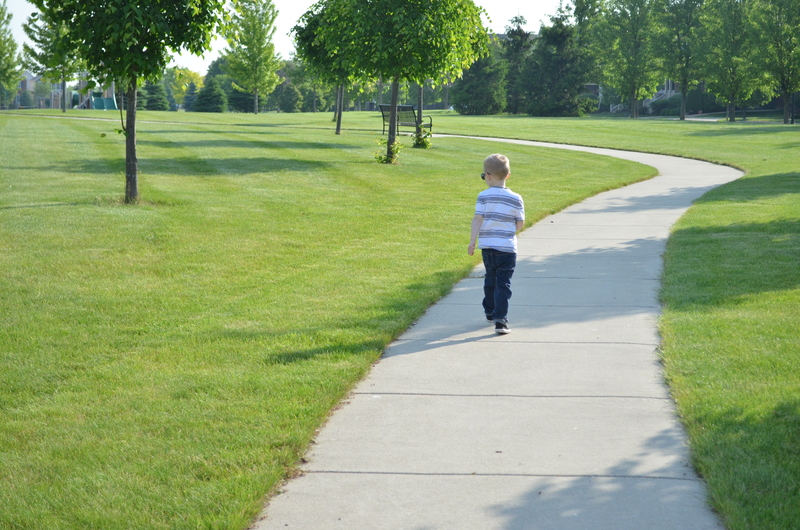 I was elated to have such a typical moment with my son, just walking, talking and telling him not to pick his nose. I just love him more than words can describe, nose picker and all. We have overcome a lot of health issues this year, and his seizures have seemed to stop with his current treatment being unchanged. His severe allergies have seem to calm down immensely, but he will always be my light sensitive boy wearing sunglasses everywhere we go. Having social anxiety and wearing sunglasses everywhere sure doesn’t work in his favor though, people think he’s trying to be cool, he gets more attention because of those glasses than he prefers, lol. That’s ok, it helps push him, which is what he needs sometimes. The good thing about having a sissy is she helps to take a lot of that unwanted attention away. As I watch this school year come to an end and I see my sweet, shy Maxwell begin to feel relaxed silly and free, I’m excited. I can’t wait to watch him grow and spread his wings to show the world the amazing heart and personality I’m watching emerge. As he walks away from me, I can’t help in this moment pictured, but feel thankful for a normal day! 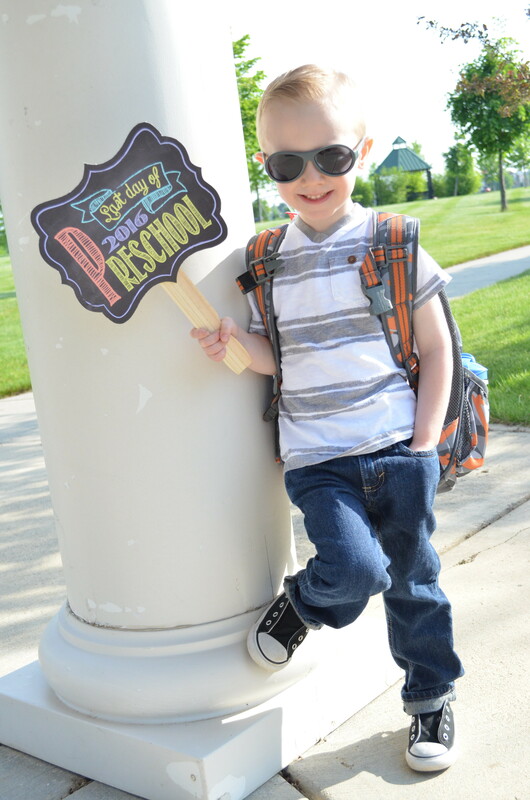 Can’t forget about this adorable end of the school year sign! You can choose any grade! After I downloaded the file it was sent directly via email to my local Office Depot, where they printed the file out on matte card stock paper. Options: Matte card stock is strong enough to hold up with out the reinforcement piece behind it, but I was going to take pictures out doors; so to prevent any bending if windy I used a second piece of card stock to reinforce the sign. « PAW PATROL BIRTHDAY PAWTY!